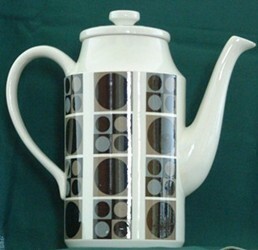 The 50s and 60s were a very exciting and innovative period in the world of ceramic design. The Festival of Britain in 1951 set the contemporary theme of the 50s. Midwinter lead the way in contemporary fashionable tableware. Their Stylecraft and Fashion shapes were popular well into the 60s. Styles in the 60s followed the roller coaster ride of the decade. Modernist, simple, geometric forms gave way to Flower Power and Psychedelia. There was even a period when it seemed that traditional ceramics might be replaced by plastic (see Melamine Tableware). At the same time, there was also a revival of traditional craft potteries, such as Poole, Portmeirion and Hornsea. 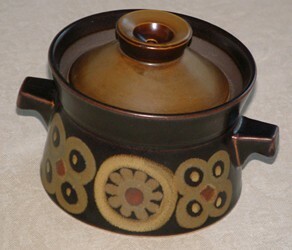 Midwinter Stylecraft is a classic example of 50s contemporary ceramics. W 'Roy' Midwinter visited the US and was impressed by their designs. He introduced Britain to the contemporary organic shape in 1952, when he launched Stylecraft. This wonderfully curvy style was a reaction against the straight lines and hard edges of the Art Deco era. Indeed, some of the motifs of Art Deco - the rising sun and the lightening flash, had gained more sinister connotations during the War. A vast range of different patterns were applied to this basic shape and to the similar Fashion shape introduced in 1955 (left). They ranged from futuristic designs inspired by models of atomic structures seen at the Festival of Britain in 1951, to the more traditional designs, such as the Magnolia pattern shown on the left. Under the leadership of Roy Midwinter, the original founder's son, the firm became the leader in fashionable contemporary tableware throughout the 50s and into the 60s. The organic shape of the fifties gave way to more simple, modern styles. Midwinter introduced the Fine shape (right). 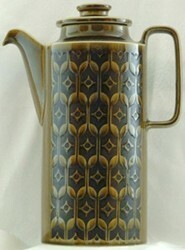 This coffee pot shows the Sienna pattern from 1962. It is one of the more popular Midwinter patterns of the 'sixties. A restrained modern look, which was perfect for the first years of the 'sixties. The middle part of the 'sixties was a period of enthusiasm for geometric designs such as Focus (left) by Barbara Brown. Midwinter introduced this style in 1964. The taste of the mid-sixties then was for the simple, geometric style, as illustrated by Mary Quant's dresses and Vidal Sassoon's hair cuts. Men wore sharp suits and fashion was still 'mod' rather than 'hip'. This simple design with its circle motif, echoing the cylindrical shape of the pot itself, was very much in the spirit of the time. Although harking back to the modernist designs of the thirties, the treatment is much less serious. It is a fun item - modernist, but slightly tongue in cheek. Where Midwinter was the leader of the contemporary market for fashionable tableware in the 'fiftiies, J & G Meakin took over in the 'sixties. They literally took over Midwinter in 1968. 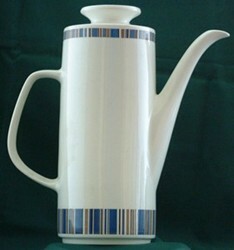 Meakin's staple shape was Studio, designed by Tom Arnold in 1964. It became the vehicle for a vast number of patterns. They ranged from restrained, almost austere modernism (left), to geometric with circles (middle), to abstract, possibly inspired by psychedelia (right). The symbol of the sixties was the flower. 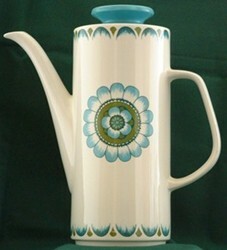 It featured strongly on Meakin's products (right). Not everyone in the 60s took LSD or smoked pot, but everyone could adopt the style of the Flower Children, even if it only meant having coffee pots decorated with stylised flowers! The Studio shape drew heavily from Midwinter's Fine. 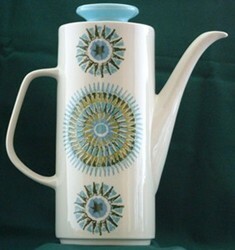 It was also influenced by the pioneering Cylinder coffee pot designed by Susan Williams-Ellis for Portmeirion Pottery in 1962. It was exaggeratedly tall and topped by a conical lid. 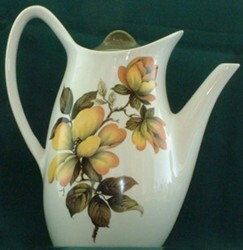 The spout and handle were curved and elegant. 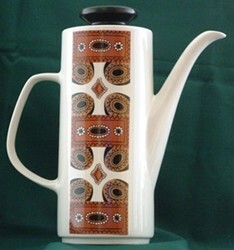 This design, more than any other, defined the shape of the 'sixties coffee pot. The raised Totem pattern is perhaps the most famous application of this shape, but the Greek Key was probably the biggest seller for Portmeiron. Hornsea Pottery has the look and feel of traditional craft. In the latter part of the 'sixties, it was a big hit with the public. The Heirloom pattern, left, was introduced in 1968. In spite of its traditional appearance, Heirloom actually used a very modern technique called glaze resist. This allowed alternate shapes in the pattern to be glazed and unglazed. Did people use mugs in the 60s? Answer: Yes. Hornsea and other potteries made a range of beakers, as they preferred to call them, with many different, traditionally influenced patterns. Another pottery that captured the spirit of the 'sixties perfectly was Poole Pottery from Dorset. They produced a range of modern pottery with a strong craft influence. Later in the decade Psychedelic patterns started to appear. Denby produced the popular Greenwheat tableware in the 50s. In the 60s the Arabesque range, designed by Gillian Pemberton in 1964, firmly established the firm's position in the market. Here the influence of non-Western culture is very strong. The earth brown colour and simple pattern make this a very forward looking design for 1964. Answer: No. One of the best selling china ranges of all time Royal Albert's Old Country Roses was launched in 1962. It was influenced by Victorian taste and was the complete antithesis of everything the 'sixties stood for!